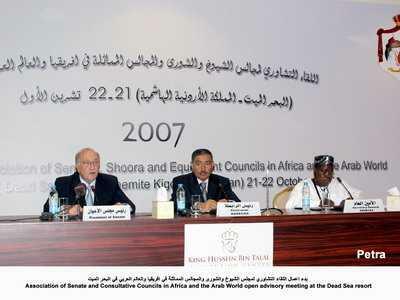 almotamar.net - The consultative meeting of the Association of Senates and Equivalent Councils in Africa and the Arab World (ASECAAW) called Monday on conflict parties in the Horn of Africa to seize the available opportunity for dialogue called for by the African Union, the Arab League, Yemen, the Kingdom of Saudi Arabia, state of Qatar and the Union of East African States in their effort to settle those disputes and end any coming suffering of population of those regions. In the statement of its closing meeting held in the area of the dead Sea, Jordan Monday the ASECAAW affirmed that all political types of rule and forms in any country are mainly an affair concerning the peoples of those countries and are chosen by those peoples and their governments without any external interference. The statement called the attention to the close relationship between the standard of education in any society and the level of those societies interaction with democracy. It confirmed in this context that democracy represents the ideal pursuit that helps formulate the economic, social and cultural policies including education. The statement also emphasised the urgent need for legislations connected to human rights and confirming the role of the civil society organisations and the principle of partnership in implementation of development programmes between the private and he public sectors regarding the political and social life. The statement called on creditor states to take immediate steps for full writing off of loans to Africa and the Arab world so that those counties are able to start removing the state of economic emergency and carry out their development projects. Concerning developments in the Middle East, the statement expressed the participants concern about what is going on in Iraq and Palestine and called on the world to sense suffering of the Iraqi and Palestinian peoples. The statement also stressed the importance of the two meetings to be held by the commercial and industrial chambers of the ASECAAW and the committee of peace and solving disputes in November and December consecutively. Mr Abdulaziz Abdul Ghani, president of the association and head of Yemeni Shura Council, noted that the association is one of the important initiatives which are aimed at exploring prospects of establishing legislative partnership and preserving interests among Arab and African countries. The annual consultative meeting of the ASECAAW concluded its sessions in Jordan Monday following two days of working meetings chaired by head of the association Abdulghani and focused on role of the legislative power in the continued efforts for achieving the millennium.